At 4.27pm PST, a little piece of the Gorda plate some 30 miles west of Ferndale, CA decided to move to the north a little ahead of the rest of its plate. According to the Eureka Times-Standard, the resulting 30-second earthquake has knocked out power in Eureka and Ferndale, and while the damage is widespread it also appears to be relatively minor. There is no count of injuries or fatalities. As is typical of a moderate earthquake, the USGS is forecasting a 78% chance of a comparable aftershock. Humboldt County, a part of California better known for making an industry out of helping folks get mellow, is going to be a bit jittery for the next week or so. In case you’re wondering, the Gorda Plate is actually not a Taco Bell item, but is the southern portion of the Juan de Fuca Plate, vestigial remnants of the long-vanished Farallon Plate. The Juan de Fuca and Gorda Plates are following the Farallon in a suicide plunge under the North American Plate. The act of one plate diving under another is known as subduction, and this particular area is known to geologists and West Coast disaster planners as the Cascadia Subduction Zone. Luckily, this particular earthquake was generated in a vertical fault on the plate itself. Why is that lucky? As the Gorda plate subducts below the the North American Plate to the east, its rocks bend and stretch, fracturing them into vertical faults in much the same way a brick would if you tried to bend it. Now the Pacific Plate is moving steadily to the northwest and mashing on the plate, so those fractured rocks tend to want to slide to the north and ease that pressure, and so you get earthquakes. But since the predominant motion in strike-slip earthquakes is horizontal, there isn’t a lot of the vertical thrusting that you need to cause a big tsunami. 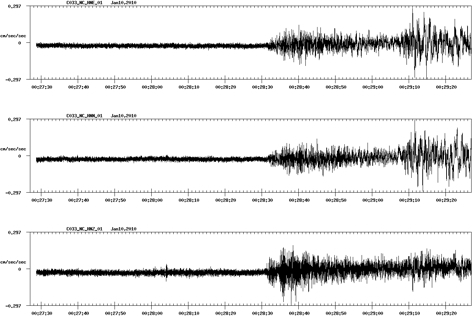 A look at a seismograph trace recorded here shows that indeed the highest amplitudes are in the N-S (top) and E-W (middle) direction. Folks are going to be pretty edgy, P.G. & E. will getting the lights back on, and grocery store owners will be picking up a lot of cans, but this was not the Big One. For now, the folks at the Pacific Tsunami Center are breathing a sigh of relief. Next post: Could the Haitian earthquake have been predicted?